Keratoconus, also known as KC, is a non-inflammatory eye disease which impacts the cornea. When an individual is diagnosed with keratoconus, their round dome-shaped cornea begins to thin, resulting in a cone-like bulge to become prominent. As you can imagine, this leads to significant visual impairment. While many people have never heard of keratoconus before, this eye condition is a serious one that requires the knowledge and expertise of a highly trained optometry team. Unfortunately, the actual cause of keratoconus is still unknown. Even though this is not as common an eye disease as others, it is far from rare. Experts estimate approximately 1 out of every 2,000 people in the general population are diagnosed with keratoconus. The majority of keratoconus cases are found in young people at the age of puberty or in their late teens. When the cornea thins and begins to bulge, a patient may experience extreme light sensitivity and distorted vision. This eye condition can occur in one or both eyes, and again, there is no known reason for its formation at this time. Keratoconus cases range from mild to severe. 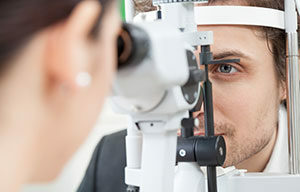 As with any eye condition, it is important for you to consult your North Arlington optometrist to ensure all diseases of vision problems are addressed as soon as possible. In the mildest cases, eyeglasses and soft contact lenses may help correct keratoconus. However, as the disease progresses and the cornea becomes increasingly thin, both glasses and contacts may no longer help with vision correction. The type of treatment needed to correct keratoconus will depend on the severity of your case and each individual person. We encourage you to make semi-annual appointments with one of the optometrists here at First Eye Care so we can ensure your eyes are healthy. By visiting our North Arlington eye care clinic on a regular basis, we will be able to detect and diagnose any issues that have presented since your last visit. The key to healthy eyes and clear vision is taking a proactive approach to your eye care, which starts by visiting one of our optometrists at least twice a year. To learn more about the symptoms and treatment options of keratoconus, please contact First Eye Care today and schedule an appointment.